In 30 Teams, 30 Posts, I write a post (of varying amounts of seriousness) about every MLB team in some way in the lead-up to the beginning of the 2016 season. Earlier installments can be found here. Today, the Houston Astros and their young star, Carlos Correa. If I was making a computer program to pick out the next “Face of Baseball”, I’d tell it to find a young position-player phenom who was bilingual and played in a large city, who has already tasted both the highs and the lows of Major League Baseball. In other words, I’d basically force it to pick Carlos Correa of the Houston Astros. Just 21, the Houston shortstop is perhaps everything that baseball would want in a new superstar. He’s young. Even younger than Harper and Trout. He’s bilingual, able to speak both his native Spanish (he’s from Puerto Rico) and English. With the great internationalization of baseball, this allows him to reach fans around the Western Hemisphere regardless of what language they speak. While he plays with joy and confidence, he also doesn’t seem to be one to make enemies or ruffle too many feathers. Not that there’s anything wrong with ruffling feathers when they need to ruffled, of course. He already knows joy and pain. He helped lead the Astros to the playoffs last season, but also was somewhat responsible for their shocking blow-up in the ALDS against the Royals. He plays in a big market- Houston is the fourth largest city in the United States! Most importantly of all… he’s good! Really good! He had 22 HRs last season despite only appearing in 99 games. He showed great speed on the bases, swiping 14 bags while only getting caught four times. And while his “slash stats” show some room for improvement, they still are remarkable for somebody so young playing at shortstop, and will probably improve in the coming years. So, in short, Carlos Correa is awesome. 8 shutout innings, 7 strikeouts. Dallas Keuchel is the MVP of Yesterday. It’s his third of the year! Dallas Keuchel is 6-25’s MVP, as he blanked the NY Yankees and struck out 12 in a complete game shutout. In 30 Teams, 30 Posts, I write a post about every MLB team in some way in the lead-up to the beginning of the 2015 season. This is the third post of the series- look here for the rest. 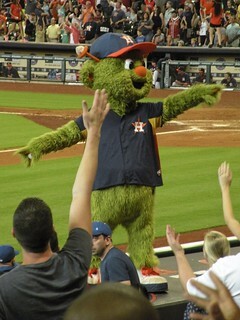 Today, I look at the one of the great rising stars of the Houston Astros- their mascot, Orbit. The Astros are going to be something. Sooner than you think, they will have one of those “What The Heck” seasons, bursting onto the scene and into the playoffs like the Rays, Pirates and Royals of past years. They will revive pro baseball on the Gulf Coast of Texas, and teach everyone the true meaning of the unit of measurement known as the Altuve. But until then, the Astros can at least rest easy knowing that they have one of the rising stars of the MLB Mascot Circuit- Orbit. Yes, Orbit, the Alien Muppet… thing. Once the mascot of the Astros from 1990 to 1999, he returned in 2012 by popular demand. And, since then, he has made his return worth it, using puns, slapstick, dancing, and mock-feuds. It is no coincidence that Orbit was brought along with the MLB All-Star Team to Japan for a recent tour, considering how great he was in 2014? No wonder, as our good friend Michael Clair once pointed out, that Astro won the Mascot of the Year Award. Today, we look at the AL West, and what could go right… and what could go wrong. Complete with Getty Images that may or may not have anything to do with the actual team. Best-Case Scenario: Billy Beane‘s @#$% finally works in October, the Athletics win the World Series, and their long-term stadium situation is finally solved. Worst-Case Scenario: Billy Beane’s @#$% doesn’t work very well during the Regular season this year, the Athletics finish third, and finish the season as a barnstorming team when their stadium in Oakland disappears in a sinkhole of bad plumbing and a dark spell cast by Al Davis in the late 1990s. Worst-Case Scenario That Could Actually Happen: See above, but remove the barnstorming, the sinkhole and Al Davis’ dark spell. Best-Case Scenario: It finally happens, and the Rangers win the World Series with the help of a resurgent Prince Fielder, the ever-underrated Shin-Soo Choo, a breakout year from Jurickson Profar and a Cy Young year from Yu Darvish. Worst-Case Scenario: Ian Kinsler is a wizard, and his wish for the Rangers to go 0-162 comes true. Worst-Case Scenario That Could Actually Happen: It all falls apart: Fielder continues to decline, Choo has an off-year, Adrian Beltre shows his age, Darvish gets hurt, Profar muddles and the Rangers have their worst year in years. Ron Washington is fired despite his recent extension. Best-Case Scenario: Mike Trout wins Triple Crown, MVP, All-Star Game MVP, the Home Run Derby title, Sports Illustrated‘s Sportsman of the Year, the AP Male Athlete of the Year, an EGOT, the Nobel Peace Prize and the Presidential Medal of Freedom as he single-handedly straps the team on his back and brings them to the World Series. Or something like that. In reality, the Angels probably need Trout to keep on Trouting while having both Albert Pujols and Josh Hamilton show their old selves and the pitching staff stepping up. Worst-Case Scenario: Mike Trout gets hurt. Fire and brimstone coming down from the skies! Rivers and seas boiling! Forty years of darkness! Earthquakes, volcanoes…The dead rising from the grave! Human sacrifice, dogs and cats living together… mass hysteria! Worst-Case Scenario That Could Actually Happen: To be honest, Trout getting hurt is arguably the worst-case scenario, as I find it highly unlikely that both the rest of the lineup can take up the slack AND the pitching takes a step forward. Best-Case Scenario: Felix Hernandez is still awesome, Hisashi Iwakuma gets better (health-wise), Taijuan Walker gets better physically and on the field, and Robinson Cano… just keeps doing what’s he’s doing. Worst-Case Scenario: Robinson Cano gets hurt in a money-counting incident, misses rest of the season. Worst-Case Scenario that could actually happen: Felix actually starts to show that he may be human, Iwakuma and Walker struggle with health problems all year, and Cano has problems playing in Safeco Field all year around. Best-Case Scenario: Ha. Hahahaha. HAHAHAHAHAHAHAHAHAHA. Are you kidding me? Even their best-case scenario sees them, at the absolute very best, in fourth place. In some ways, their best case scenario may actually be for them to have one of the worst records in league, as it’ll let them get better draft picks. Worst-Case Scenario: 1898 Cleveland Spiders. Worst-Case Scenario That Could Actually Happen: 1962 New York Mets.